Thanks to all the Girlfriends who made last week's Wine Circle get-together such fun – with special thanks to Teri and ATEHO, her gorgeous place to shop for unique, tasteful gifts. 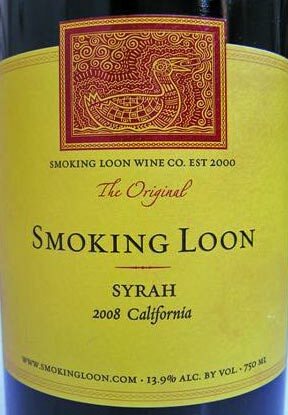 We closed out Spicy Reds with a quirky pick: Smoking Loon 2008 Syrah, a wine that weaves together the ripe berry fruit, pepper and spice that makes Syrah so seductive. I'd read about the wine on Tim Fish's blog for Wine Spectator in which Don Sebastiani, Jr., whose company produces Smoking Loon, made some strikingly candid remarks. Fish noted that his WS colleague James Laube gave the wine an 87 (which indicates a very good wine with "special qualities" in the Spectator's scoring system), leading Fish to ask what it takes to make a very good $8 bottle of wine. So how does Sebastiani and Sons do it? In essence, they use a combination of science and shortcuts. The wine's color may get punched up by a tiny amount of the natural grape concentrate Mega Purple. How about some oak for toastiness, aging and tannin management? Smoking Loon gets the kiss of oak Syrah needs with oak staves rather than logging time in expensive, space-demanding barrels. OK, no surprises there but few winemakers are inclined to talk about those things, no less to a publication with the reach of Wine Spectator. The science behind the Smoking Loon Syrah involves micro-oxygenation or "micro-ox," a technique that introduces small, controlled amounts of oxygen into the wine during fermentation or aging. Micro-ox can help soften tannins, weave together a wine's flavors or give winemakers more precise control over the wine's aging. You might liken it to using an aerator on a mega-scale. Micro-ox has been around for a while. About five years after micro-ox was developed in 1991 by a scientist working with Tannat, an exceedingly tannic varietal, the European Commission allowed for its use in winemaking. You may remember it from the movie Mondovino (2004), in which influential globe-trotting enologist Michel Rolland suggests it to some winemaking clients. Today, micro-ox is used worldwide, from Bordeaux to Chile. So that's how Smoking Loon was chosen as the closer. Beyond its sure-to-please flavors, it also fulfills an "interest quotient" for added instructional value worth sharing. Loon is tasty, varietally correct, inexpensive and locally available ($6.99 at Trader Joe's and even less at bigger box stores). It earned a respectable score – which carries weight whether we want to think so or not – and carried a good back-story. While my personal Syrah preferences lean to K Vintners, Rusack, Alban, Andrew Murray and Cayuse (if I can ever get my hands on it again), the TJ wine won out with a good story. Come to think of it, those other wines have some pretty remarkable stories too. Join us next time and we'll uncover some more.